The market action last week spooked a lot of people. My account actually rose on bizarre Thursday, with my position in TYP. This is now a good time for me to be in cash on the sideline. The GMI and GMI-R are both back to one. The only indicator that is still positive is my weekly indicator of the QQQQ. 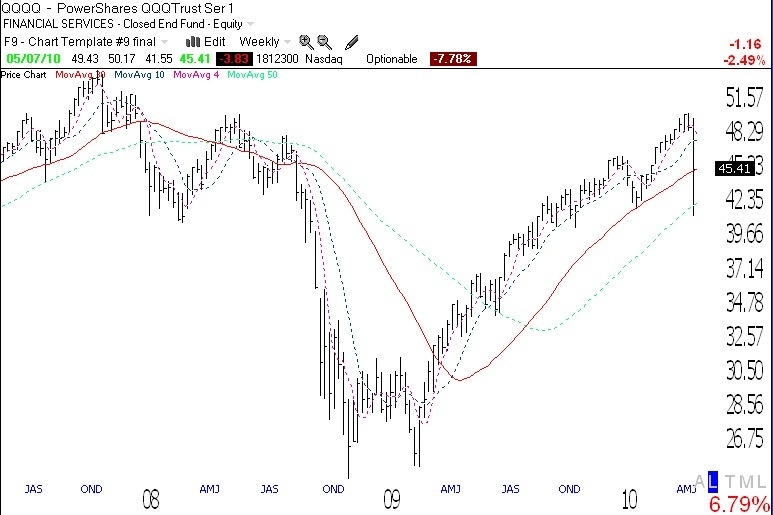 The QQQQ remains in a Stage 2 up-trend (see weekly chart of QQQQ), as defined by Stan Weinstein (see his book to right). So, in my trading account I am short and mainly in cash. In my university pension I remain fully invested in mutual funds. I only transfer my pension funds to cash when the weekly trend enters a Stage 4. By that time, the 30 week average will have curved down. I have successfully avoided past major down-trends by getting out at the beginning of a Stage 4. 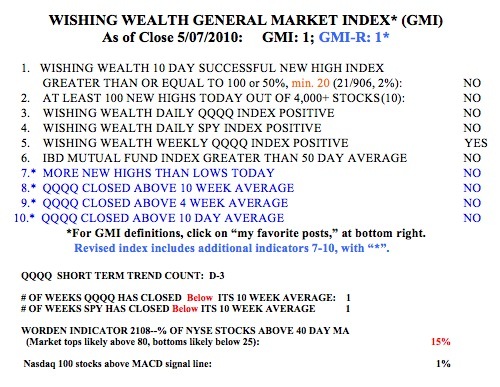 Note that the QQQQ closed right on the 30 week average (red). As long as the 30 week average continues to rise, I will ride this up-trend in my pension account. In spite of the short term down-trend in the QQQQ, I do not think this is the time for me to begin to short stocks in my trading account. This is because the Worden T2108 indicator, at 15%, is already in an area where prior bottoms have occurred. If this indicator, which declined from 64% last Friday, should hit single digits this week, I would be looking for a bottom. I might even buy some QLD (ultra long QQQQ ETF), if that occurs. Every time I have said this, I get scared when the T2108 hits such a depressed level. This time I will try to take advantage of a further drop into such an extreme level. The T2108 touched 6% at the re-test of the bottom in March, 2009, and 1% at the panic bottom in October, 2008. These were extreme readings, however, not seen any other time in the past decade. Friday was the third day of the new QQQQ short term down-trend. I will be more certain of this new down-trend if it lasts for 5 days. Once we pass that point, trends tend to last for a while. Note that only 1% (1) of the Nasdaq 100 stocks closed with its MACD above its signal line, another sign of short term weakness. For the first time since February 4th, there were more new 52 week lows than highs (46 vs. 10) in my universe of 4,000 stocks. This is not the time for me to be buying stocks at new highs. I looked at the performance of the IBD 100 list published on Monday, 4/12/2010. Since these stocks closed on 4/9, only 17% have advanced through last Friday. Put another way, during this period the QQQQ has declined 7.4%, while more than half of the IBD100 stocks declined 9.5% or more. Growth stocks tend to go up more in up-trends and decline more in down-trends, as traders take profits. For example, since 4/9 to 4/26 when the QQQQ topped, 50% of this IBD100 list advanced 4.9% or more, while the QQQQ increased only 2.8%. So I continue to concentrate my buying in IBD100 stocks, but only in QQQQ short term up-trends (within a longer term up-trend). By the way, remember I ran my submarine scan on 4/29? Well, since then, all nine of the stocks that came up have declined, as did all of the Nasdaq 100 stocks. Three of the nine (33%), however, are down 17% or more, during a time when the QQQQ declined by 9.6%, but only 5% of the Nasdaq 100 stocks declined 17% or more. So,at least that time, the submarine scan did select stocks with a greater likelihood of sinking more during this period. Remember, one must trade with the trend in order to maximize the chances of success. Right now, the short term trend is down, and I will not go long. (The longer term trend is still up (Stage 2), so I will keep my pension invested in mutual funds and continue to dollar coast average in with new contributions, until it looks like Stage 2 is over.) I trade like a chicken, run from a down-trend, and conserve my capital to trade only when the odds are in my favor. Within the last few weeks you disagreed with Cramer’s advice to avoid stop losses. Most of the trading advice I have read agrees with you, as I do. However the people who got hurt in last thursday’s wild computer driven drop were the people who had stops in place. (including myself) I am now uncertain what to do. “and most of the 120 attendees said they would take my course on the market if it were ever offered more widelyâ€¦â€¦â€¦”. I would too ! Thanks for the blog. A stop set at price “x” does not guarantee you will get that price, especially when stocks gap down or fall quickly. I can only tell you that my rules got me out of stocks or hedged before Thursday’s decline. Go back to my prior posts to see my reasoning. So, my stops were set close enough to the stock’s price that I got out before the slide. No strategy in the market is perfect, and as Livermore used to say, the market exacts its tuition from all of us. The key is to learn from our mistakes and revise out rules so that the tuition we paid was worth it. For me, stops are the sine qua non of successful trading. I did not take your advice to move my stop up closer to the price. Not only did I not protect my profits, I had a substantial net loss because the price overshot my stop. This has been a very expensive and painful lesson. Tom, sorry to hear about your losses. The market was absolutely ridiculous on Thursday. The market was so illiquid that by the time one of my stop orders went to market it was executed at $1.00 above my stop price! From now on I’ll be using stop-limit orders to safeguard against this. For instance, if my stop is at 47.83 I might put my limit at 46.83 so that if something like this happens again I would not be stopped out. This means you have to pay closer attention though because if your stock gaps down below your limit (say a bad earnings report) you would not be protected. Still I think the advantages outweigh the disadvantages here. I wish there was a sort of time modified stop order where your stop order is only sent to the market after the stock falls below your stop price for a set amount of time. An example would be something like “stop me out of PCLN if it trades below 229.81 for 20 minutes.” This would prevent from getting stopped out when a stock momentarily falls below your stop. This happens a lot, especially with less liquid securities. The risks on this would be fairly low… rarely does a stock fall precipitously in a matter of minutes without eventually coming back on the day. For example, if you look at Garmin (GRMN) on May 5th, it opened at 32.50, fell to 31.99 within minutes but was back up to 34.00 by 10am (30 minutes later). I don’t want to get stopped out when my stock trades below my stop price on just a few thousand shares only to see it climb back up 5% minutes later.